Oh what a proud daddy I was today. I got to help my 8 year old daughter purchase her first weapon! It may be a thinly disguised “finger in the eye” of my lovely wife who, despite allowing me to share her life…forever, father her children, and generally provide for the security of our family, will not allow me to purchase a pellet gun. So, thus un-armed, I was able to live somewhat vicariously through my 8 year old daughter today as she purchased a sword in Toledo. But first a bit of background on what in our house is called “the pellet gun issue.” In reality, I am the only one who calls it that because in my wife’s mind there is no issue. In fact the only words her I ever hear her say about “the pellet gun issue” are “NO”. I think she may be closet Republican. When I was a kid growing up as the son of a hardscrabble technology worker, I was afforded the opportunity to shoot things with a gun. Targets, clay pigeons, and pheasants were just a few of my favorites. I used to go, with the alcoholic father of my best friend, twice a week to the shooting range. He (the alcoholic father) drove of course, after stopping by the liquor store for a six pack “for the road” (it was only about 10 miles to the range and the beer was gone long before we pulled in the lot). I , at 12 years old, reloaded my own shotgun shells in the garage. I tied my .22 rifle on the side of my 10 speed and rode my bike, alone, up to the shooting range and would spend all day blasting away at little paper targets. Oh, those were the days! Fast forward 30 plus years and I can’t even sneak a little tiny decidedly non-lethal pellet gun into our cabin in the mountains. “But honey, what if a stray dog attacks? Or a coyote? Or a rabid squirrel?” I ask. “If that happens” she says, “then I will push you outside in your shining underwear to do battle with whatever threatens us and to save our family while we lock the doors and remain safe and pellet gun free in the cabin…and that’s a sacrifice I am willing to make!” Oh, the sensitivity of that woman overwhelms me! So Riley spies these swords with her little eyes. Now these are not the cute little plastic jobs with tennis balls glued the business ends you might find in a touritic shop near the beach, but the real deal. While they do not have a sharp edge, they would really do some damage if you were to poke someone in the eye with one of these, or in the belly, or, in fact, if you were to poke them just about anywhere! I, for one, would not be opposed to using this thing against a burglar, a stray dog, or a Jehovah’s Witness run amok…lacking a pellet gun, it is probably the next best thing. But for an 8 year old? "Taylor...say goodbye to your ears!" To my surprise, when we talked the sword issue through, over a cup of coffee, my pacifist, husband-sacrificing wife was not entirely opposed to the idea of buying Riley a sword. I quietly danced a jig in my little plastic chair! My kid’s first weapon…a red letter day in any Dad’s life. But which one! Riley was so excited as we went from shop to shop in search of the perfect sword. One was too big, many were too expensive, but this one, yes this one, was just right. It was small enough that she could get her pudgy 8 year old hands around the hilt. It was light enough that she could swing it with sufficient force as to scare me and she had enough euros to buy it. 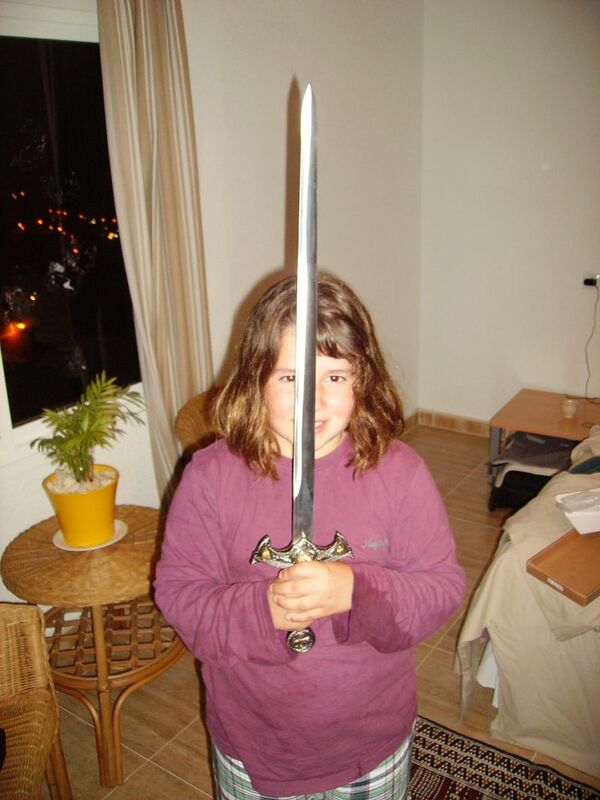 Plus it came with a scabbard… a good thing for us! It is to remain under lock and key until you are old enough to figure out where we hid the key. You are not allowed to let your boy cousins use this. When you are old enough to date, you are allowed to put this in your purse when you go out on dates and your mother will make a nice matching sash so you can strap this puppy on your prom dress. After the purchase was consummated, Taylor was the one with the most concern in the family. 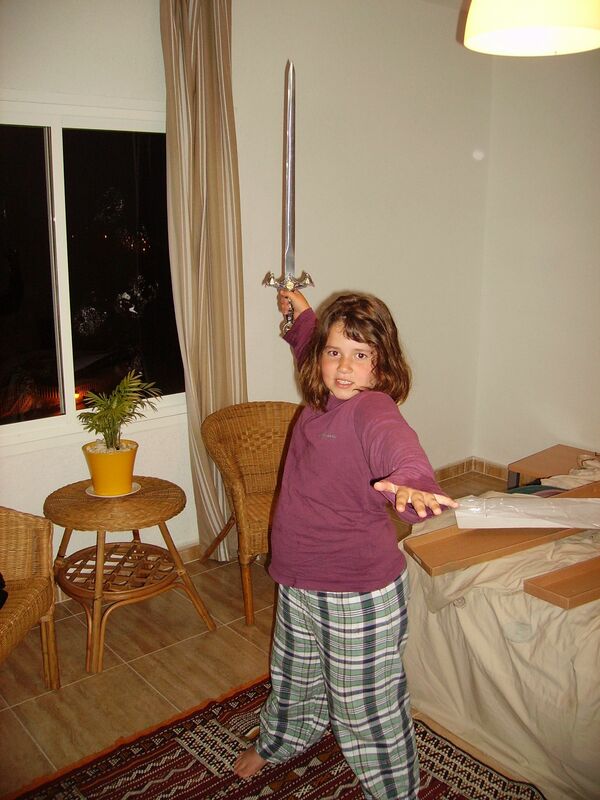 As we walked out of the sword shop she said to Laura…”great idea Mom, say good bye to my ears!” I am not sure if she was kidding or not but when we got back home and she went to bed, she locked her door. Taylor bought some nice earrings in Toledo. I was once questioned by more than a few people when, for Christmas, I bought Riley some hockey sticks. “Who thought that was a good idea” I was asked by many folks, mostly neighbors with small children, or pets, or windows facing the street. But this time is different. This time, should something unthinkable happen, I can quickly defuse the situation by saying to Laura “You said it was OK.” A strong offense beats the best defense…every time. So as we prepared to leave Toledo, I suggested we put the sword in the trunk as I do not want to be arrested by The Guardia for carrying a loaded …sword! The windmills made famous by "Don Keykong"
Our next stop was the “Molinas del Viento” in a small town called Consuegra. We had seen these iconic Quixotic windmills from the road on our way in and I had to stop to investigate on our return trip. These are the windmills that Don Quixote attacked with his faithful squire Sancho Panza, thinking they were fire breathing giants. They are the windmills you see in all the Spanish travel brochures …and they looked really cool. There also was the random 12th century castle alongside the windmills that we could investigate. We were able to drive near the windmills and stopped and had a great picnic lunch in the shadow of these 16th century windmills. My kids were less than interested in walking up the trail to see the windmills. Riley exclaimed that she wasn’t that interested in windmills “made famous by Don Keykong”…her nickname for Don Quixote. But Laura and I wanted to go…so we did. We left the kids in the car and took a few minute to walk by ourselves and explore the windmills. Now we could see the kids the whole time but it felt a little weird through, leaving the kids alone in the car, in a foreign country. I’m going to nail the darn thing to the wall so she can never get it down 🙂 But seriously it is beautiful and to see her with it is preciosa! Double underline the boy cousins part!!! I seen them with light sabers…ears would be lost. Tenemos muchas ganas de veros y que nos conteis personalmente vuestras aventuras por las tierras de Castilla. 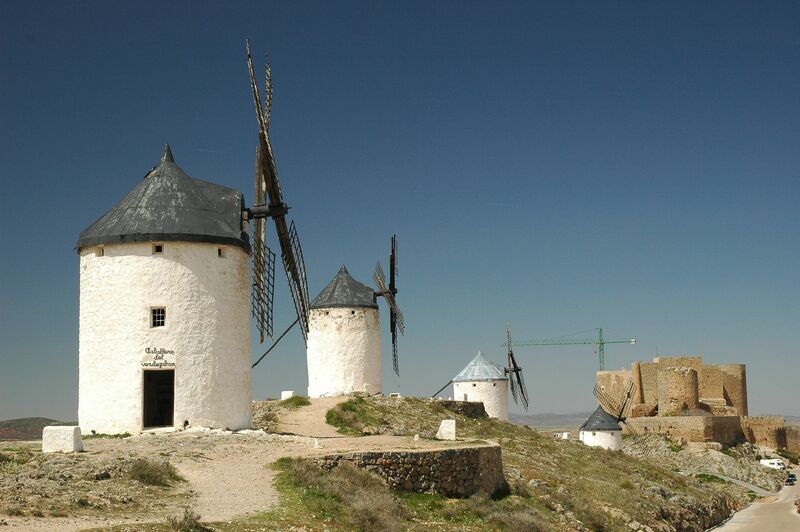 Don Quijote de la mancha abandonó su aldea natal en busca de aventuras. En aquella ocasión, tal hidalgo caballero no se hizo acompañar de su bella doncella ni de sus vástagos, sino de un fiel escudero al que prometió que le nombraria Gobernadro de una ínsula. En esta, a su imagen y semejanza tus aventutas en compañía de la doncella de Los Gatos y las princesas de California, superando el mal tiempo y enfréntandote a los molinos (representados por Taylor y Riley)lograis despartar la admiración y el aprecio de los que os rodean. Al igual que de Don Quijote, de vosotros tenemos mucho que aprender. !Es la verdad! Fue una experiencia marveloso, pero mis ninas prefieren a mirar la pelicula ?Por que andais en la tierra de Don Quixote cuando podeis permanecer calentita y acogedor en el coche? Hasta luego…. Lala…does this mean that we should take the swords we bought for the boys back to the store? Only kidding…I like their ears just the way they are!